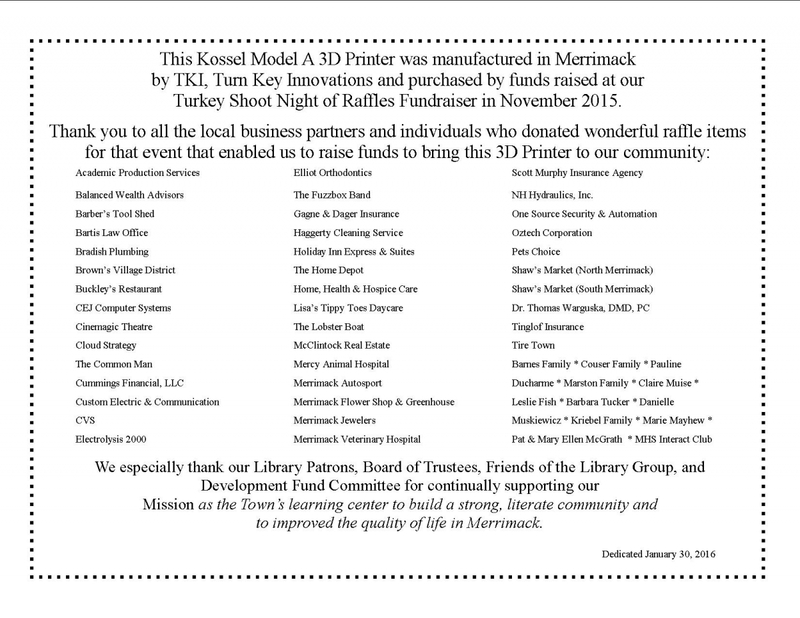 Through funds raised at our 2015 Turkey Shoot Night of Raffles Fundraiser, we purchased a Kossel Model A 3D Printer from TKI, Turn Key Innovations, Merrimack. Our printer was dedicated January 30, 2016. The Library’s 3D printer, including our 3Doodler Pens, are available to make three-dimensional objects in plastic using a design that the patron has provided as a digital computer file. In violation of another’s intellectual property rights. For example, the printers will not be used to reproduce a material that is subject to copyright, patent or trademark protection. Priority is given to Merrimack Public Library cardholders. The Library reserves the right to refuse any 3D printing request. At this time, there is no charge for this service. Print-on-demand objects must require less than 10 hours to print each piece. Multi-piece requests will be considered on a case-by-case basis. The Library is not responsible for any damage, loss, or security data arising from the use of its computers or network, nor for the functionality or quality of content produced on the 3D printer. Supervision of the use of the 3D printer by Library staff does not constitute knowledge, or acknowledgment, of any unapparent final use of the 3D product, and the Library specifically disclaims any knowledge thereof. The Library reserves the right review all files before printing and to refuse scanning and/or producing any content at any time at the discretion of the Library Staff. Schedule and access to the 3D printer will be determined by Library Staff. This policy, adopted in January of 2016, will be reviewed every six months to allow for evaluation of the use of this technology by staff. Approved by the MPL Board of Trustees January 19, 2016; reviewed and approved July 19, 2016. Please see the Reference Librarians to submit a request. These websites from 3dprinter.net are the major repositories for finding and downloading free 3D models for use with a 3D printer. The sites files range from very simple free 3D models to very complex 3D models. 3D ContentCentral hosts free 2D and 3D CAD files from engineers and firms. You can also request models. CG Trader has both chargeable and free models, both those ready for 3D printing and those not. You’ll have to use the filters to select just the free models. Operated by Defense Distributed, the site was a makeshift response to Makerbot Industries’ decision to censor firearm-related files uploaded at Thingiverse. They are started as a host of firearms related files, but have now expanded to the inclusion of ANY file, regardless of intellectual property rights. NOTE: DEFCAD files have been removed from public access at the request of the US Department of Defense Trade Controls. Until further notice, the United States government claims control of the information. GrabCad is a site for engineers to show off and share their CAD works, with over 75,000 free models available. .stl filter available. TurboSquid is a large repository of both pay-for and free 3D models. There’s no area dedicated specifically to 3D printing, but there are selectable filters such as .stl and .sldprt (Solidworks part). Thingiverse is a huge community of people who create and share 3D designs freely, so that all can benefit from them. Widely used by the RepRap Project, and by 3D Printer and MakerBot operators. A free, easy-to-use design tool to create your own 3D designs! TraceParts is a huge 3D parts database founded in 1989 with some very complex CAD files available in numerous formats, including .stl. The Trimble 3D Warehouse (formerly Google 3D Warehouse until purchased by Trimble) is a free, online repository where you can find, share, store, and collaborate on free 3D models created in SketchUp. This is a great place to look for models of famous buildings, as SketchUp interacts with Google Earth. If you have the .stl file in cloud storage please provide a link for it here, so that library staff may access it and download it. Please remember to make it accessible to us.